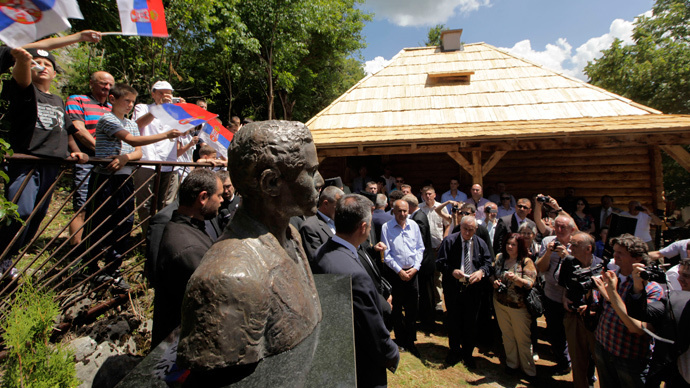 Mixed reactions followed the unveiling in Serbia of a statue to Gavrilo Princip, whose murder of the Austro-Hungarian crown prince triggered the World War I. Princip still divides the region, with some viewing him as a hero and others a terrorist. Hundreds attended the unveiling of the monument on Sunday, happening on the 101 anniversary of the 1914 assassination, also the Serbian holiday of St. Vitus. At the ceremony, Serbia’s President Tomislav Nikolic called Princip a freedom fighter and a hero. "Today, we are not afraid of the truth. Gavrilo Princip was a hero, a symbol of the idea of freedom, the assassin of tyrants and the carrier of the European idea of liberation from slavery," Nikolic said. “Others can think whatever they want,” Nikolic added. The 2-meter tall bronze statue was a gift of Bosnia's autonomous Serb Republic, Reuters reported. It will be situated in a square near the Serbian government headquarters and the finance ministry, near the Belgrade restaurant Princip often visited and where he and his accomplices allegedly masterminded the murder of Archduke Franz Ferdinand. Austria-Hungarian Empire blamed Serbia for organizing the assassination in Sarajevo on June 28, 1914. Austria-Hungary with its ally Germany attacked Serbia, whose allies Russia and France responded, unraveling the war. Later on, the British Empire joined the fighting. Princip, who was not executed because he was 19 at the time of the attack, died of tuberculosis in detention before the war ended. He is still regarded as a controversial figure in the Balkans: in Bosnia, Serbs view him as a hero, while Muslims and Croats think Princip is a terrorist and a nationalist fanatic. Current Bosnian Serb leader Milorad Dodik said during the ceremony that the monument was equal to “fighting for freedom today”. Fourteen million people were killed in World War I, 5 million of them civilians and 9 million military. A further 7 million military personnel were left permanently disabled.